Eradicidin Forte is an exciting, new time release tablet containing an exceptional mix of potent plant oils to help maintain the balance of the digestive system. Oregano, clove, cinnamon and garlic are aromatic plant extracts that are traditionally used in foods to prevent spoilage and contain high levels of phenols, antioxidants and terpenoids. Eradicidin uses freeze-dried and emulsified oils to maintain freshness and stability. Together they form a perfect synergistic combination with natural cleansing properties. 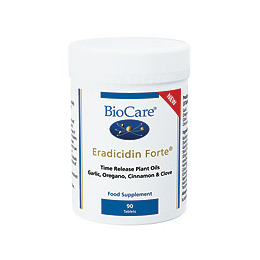 Eradicidin Forte includes plant fibres and minerals compounds to form a natural time release tablet ensuring controlled delivery of active phytonutrients to exactly where they can deliver maximum benefits. 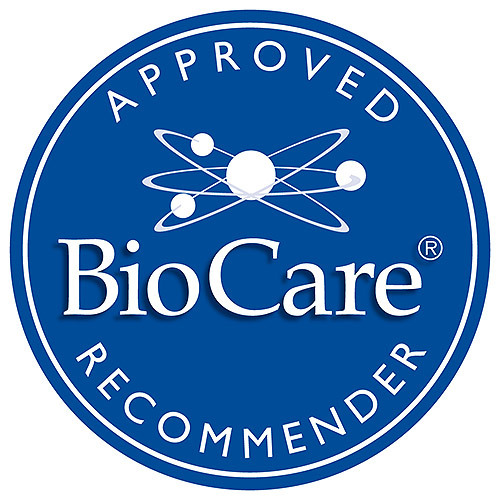 Time-release Eradicidin Forte represents a huge step forward in gastrointestinal supplementation and will be important in helping to maintain a healthy and normal microbial environment in the digestive system. Bulking Agents (hypromellose, Dicalcium Phosphate & Cellulose), Freeze Dried Garlic (Allium sativum Clove), Modified Tapioca Starch, Potato Maltodextrin, Oregano Oil Powder (Origanum vulgare Leaf), Clove (Eugeniacarophyllus Fruit), Tablet Coating ([Glazing Agent: hypromellose & Glycerin] & Colour [Titanium Dioxide]), Cinnamon Oil Powder (Cinnamomum zeylanicum Bark), Anti-Caking Agents (Magnesium Stearate & Silicon Dioxide), Acacia Gum, Antioxidant (Natural Mixed Tocopherols1), Sunflower Oil. Take 1 tablet taken three times daily with food, or as professionally directed. Caution is advised for individuals with colitis, gastiritis, or ulcerative conditions of the stomach/intestine. Below are reviews of Eradicidin Forte - 90 Tablets by bodykind customers. If you have tried this product we'd love to hear what you think so please leave a review. Thank you for the prompt delivery. This is a good, strong, natural anti-fungal. This really helps support an anti-candida diet and has no side effects for me. 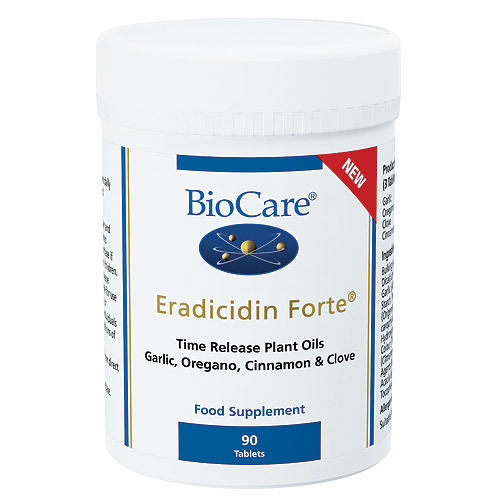 BioCare Eradicidin Forte is an exciting new time release tablet containing an exceptional mix of potent plant oils and Garlic, Oregano, Cinnamon and Clove to help maintain the balance of the digestive system.